As I mentioned in my last post, we had our annual cookie swap at school this week. This meant a full day of me baking cookies (and taste testing them approximately 26830 times to make sure they were good), followed by a full day of me eating everyone else's creations. And after consuming what seemed like at least my body weight in cookies, I was craving fruit and vegetables like crazy! I don't know if this happens to you guys, but if I eat too much junk in a day, my body practically screams for something healthy and I can't bare the thought of eating anything other than apples the rest of the day. This salad was a little fancier than apples but still satisfied my craving for something fresh and healthy perfectly, with the bonus of being winter-appropriate and also incredibly tasty! 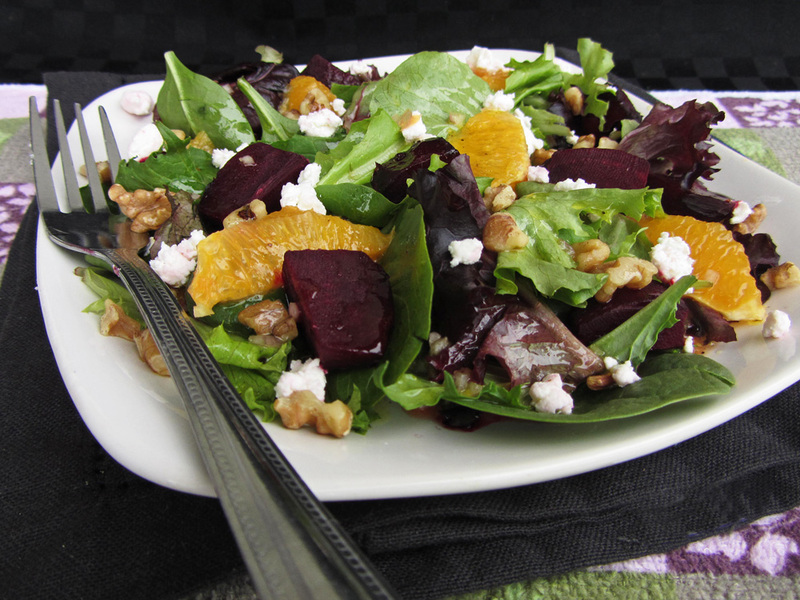 Mixed greens are topped with roasted beets and oranges, tossed with some toasted walnuts and crumbled goat cheese, and finished with a sweet citrus reduction dressing. While it may be a little more time-consuming to make than most salads (considering the roasting time for the beets), it's still really easy to make and elegant enough to serve to guests during the holidays (though eating it all to yourself to help counteract the effects of cookie overload is highly encouraged). Preheat oven to 400°F. Scrub beets and place whole on foil-lined baking sheet coated with cooking spray. Bake for about 1 hour, until tender. Let cool slightly, trim off roots and stems, peel off skins, and cut into small wedges. While beets are cooking, bring orange juice and sugar to a boil in a small saucepan. Let simmer about 10 minutes or until reduced to 2 tablespoons. Pour into a medium bowl and let cool slightly. Add shallots, vinegar, salt, and pepper and stir with a whisk. Gradually add oil, whisking constantly. Arrange salad by dividing mixed greens among plates, topping with beets and segmented oranges, then sprinkling with about 1 tablespoon each walnuts, dressing, and goat cheese per salad. This is the kind of dish I need to eat between all of this holiday binging! Beautiful and healthy!!! Thanks Teanna :) I feel the same way about needing more meals like this lately! I might try this again as a main course with chicken or chickpeas or something..
We have fresh beets and romaine lettuce that we picked from our garden. I marinated chicken in Durkee Grill Creations Italian Herb marinade and grilled the chicken for about 5 minutes each side. I roasted the beets like you said and they were perfect. I had goat cheese with herbs that I cut up. On the dressing, I didn't read the directions and mixed everything together with cooking the orange juice. OOPS! But it was fabulous! I used quite a bit tossing the romaine, but it was light and wonderful! I cut up the beets and then sprinkled it all with chopped walnuts. YUM! My husband is still talking about it. Thanks for the inspiration! This is a keeper. I want to try to cook the dressing and see how that is. Thanks so much for sharing the details of your version, it sounds even better than this one! I'm glad to hear the dressing still worked out that way, and I bet it was great with marinated chicken - yum!